Ibar Golf Club is a company founded by the Dolna banya Municipality and Lazarov & Nedev for the purpose of designing and constructing a private “members only” Golf & Spa recreation complex on an 18-hole Championship Nicklaus Design Golf Course with villas and apartment houses. The shareholders in Lazarov & Nedev are Mr. Ilia Lazarov and Mr. Kiril Nedev. Mr. Lazarov used to be Head of Office of H.E. Mr. Petar Stoyanov, President of the Republic of Bulgaria (1997 – 2001) . Mr. Nedev has been involved in the private sector as a Director of a multinational company since 1991. Ibar Golf Club is located near the town of Dolna banya, only 70 km away from the capital city of Sofia, and is the first Nicklaus Design PGA course in South Eastern Europe. Dolna banya is only 18 km away from the slopes of Borovets – the oldest, biggest and most modern ski resort in Bulgaria, undergoing a massive improvement thanks to the “Super Borovets Project”. 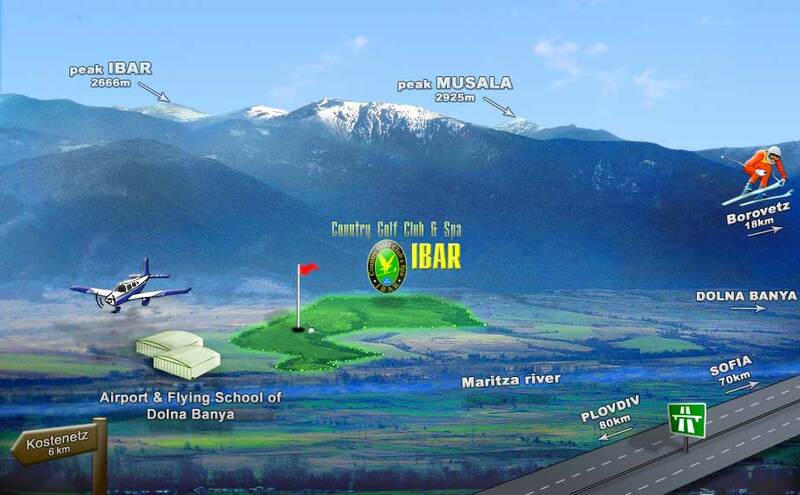 Ibar Golf Club is very attractive because of his good location and its proximity to the Rila Mountain and the airports of both Sofia and Plovdiv, the two biggest cities in Bulgaria offering numerous opportunities for shopping and entertainment.